Ever seen honey bees foraging for water on your outdoor clothesline? When Extension apiculturist Eric Mussen of the University of California, Davis, addresses beekeeping associations, he tells them to "always provide water for your bees on your property. Otherwise, they will visit the neighbor's hanging laundry, bird bath, swamp cooler, dog dish, leaky hose connection, etc." Bees collect nectar, pollen, propolis (plant resin) and water for their colonies. 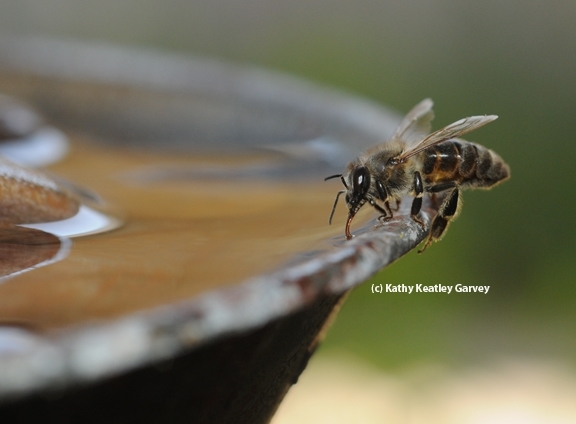 On very hot days, you'll see scores of bees at a water fountain, bird bath, or pond. 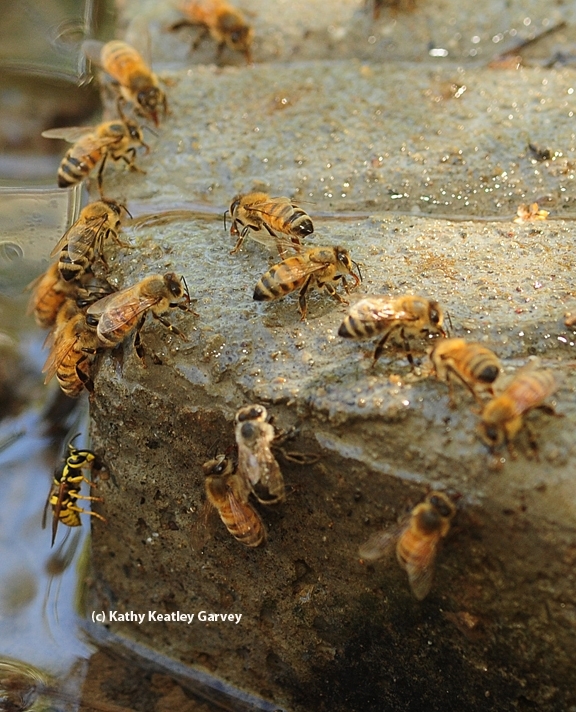 Kim Flottum, editor of the Bee Culture magazine, writes in his book, The Backyard Beekeeper: An Absolute Beginner's Guide to Keeping Bees in Your Yard and Garden: "A summer colony needs at least a quart (liter) of water every day, and even more when it's warm." Flottum points out: "Water is as necessary to your bees as it is to your pets and to you. Whatever watering technique you choose for your bees, the goal is to provide a continuous supply of fresh water. This means while you are on vacation for a couple of weeks, when you get busy and forget to check, and especially when it's really, really hot--bees always need water." With temperatures soaring to 100 degrees today in Yolo and Solano counties, that's good advice. Mussen and Flottum acknowledge that bees are industrious and will find water somewhere even if their regular source is unavailable. "Water is used to dissolve crystallized honey, to dilute honey when producing larval food, for evaporation cooling during warm weather, and for a cool drink on a hot day," Flottum writes in his book. We've watched bees gathering water from our bird bath. We've seen hawks, doves, squirrels, crows, finches and bees sipping water there--as well as our cat, Xena the Warrior Princess. Not all at the same time, though! The Cooper's Hawk reigns supreme. At the Harry H. Laidlaw Jr. Honey Bee Research Facility at UC Davis, bees can sip water from a slanted board propped against a slowly dripping faucet, or from the specially designed watering devices at the nearby Häagen-Dazs Honey Bee Haven, a half-acre bee friendly garden that doubles as an educational resource. Bees know exactly where to return for the same water source. "Foragers seem to seek water sources that are scented," Flottum says. This could be from a roadside ditch, storm drain, fish pond, dog dish or bird bath. "Foragers will mark unscented sources of water with their Nasonov pheromone so others can locate the source too," Flottum writes. Flottum's book is one of the "must-have" books for a beekeeper's library or for anyone wanting to learn more about bees. You can read more about bees in Mussen's newsletters, from the UC apiaries, posted on his website. Thank you for the very informative article and great photos. Ever since we installed a pond in our garden, we've been fortunate to have bees visiting almost constantly. Without fail, early in the evening they make a beeline for our neighbors' hives. I have a water fountain and the bees are visiting and usually I put a cap ful of bleach in to keep the algae from growing and the musquietos too ! is this bad for bees 1 tbls in about 10 heal of water ? Would this also attract carpenter bees? I would love to do this, but my condo community has a terrible problem with carpenter bees. The last thing I want to do is help the carpenter bees thrive in our wood. We live in Yuma Az. I have bees in my backyard year-round. I have a bird bath where they water. However, when it's 110-plus degrees, it's a busy place. I like the idea of a second watering hole. Thanks, enjoying a spectacular day at a fountain trying to figure what the bees are doing?? Question answered! The bees are happy and giving me a quick "buzz" vestigating me in a friendly way. Never too old to learn. Our neighbors' back yard has a bee hive. I'm fascinated watching the bees and was wondering why they come gathering when I water my garden. Your article taught me why. How far will they go for water? Hi, My neighbors have bee hives and for the past few years, I have been providing water for them. It's a problem for the birds as the bees are constantly on the birdbaths. I don't have a fountain but wondered what else I can do to provide water for the bees. It's deep and with certain containers they drown. I am constantly worried about them. Since the birdbaths are shallow, they dry out quickly on hot days and sometimes no one is home to keep them full of water. People who have the bees don't actually live on the property I don't think.